If you are a member of SFWA, you may view my quarterly presidential report in our private forums here. Please have a look. If you are not a member of SFWA, here’s David Bowie singing “Starman” back in 1973. To be clear, SFWA members may also watch that video, if they wish. They’ve added a Kaffeklatsch for me on Thursday morning, which is very cool because I enjoy doing those. I’ve added it to the total schedule here. Lord knows I’m not a fan of Michelle Bachmann, whose politics I would best describe as “opportunistically insane,” nor have I avoided commenting on her crazy, crazy eyes in the past, because, damn, the lady brings the crazy eyes. 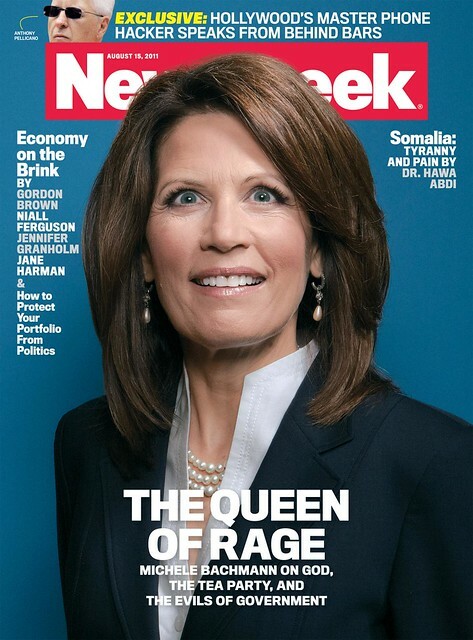 For all of that, this particular picture of Ms. Bachmann on the cover of Newsweek seems a cheap shot to me. If it had been my magazine, I wouldn’t have used it. I might have chortled when someone suggested it, but then I would have said, yeah, okay, we’ve had our fun. Where’s the real picture? Because I’m not twelve, you see. For those of you hoping to meet me/stalk me/gaze adoringly into my eyes whilst you savor my every word at Renovation, this year’s Worldcon, here is my current schedule. Note please that it includes one item which will be on the published schedule that I will not be at, and one item that is not on the published schedule that I will be at. Notes: This program item was sort of sprung on me, but what the hell. I’ve already warned the convention that they better have someone on hand to help me with the projector, because I know nothing about how to operate one. It’s a fan place now; the online community can be considered a fannish subject, but why are people still beating it up, when it complements so much of what we do as fans? Notes: People are still beating up the online world? That’s adorable. A conversation with me on whatever folks want to talk about, around a coffee table. Notes: KaffeeKlatsches require one to sign up and the sign ups are first come, first served, so if you want to do this, it’s best if you find the sign up sheet early. Notes: Bring books and other objects you wish to have signed. They will be signed! It’s that simple. If a man tapes bacon to his cat and no one can see it, does anyone care? If a fan is drawn in a bikini and the picture is printed, is the speculative experience more real? How photos and illos affect how we share and form our concept of the fannish community, and how that is changing in the digital era. Notes: More proof I will be forever defined by Bacon Cat. Some SF TV shows and movies have science advisors. What do science advisors do? How much say do they have? Can they prevent mistakes or are they generally ignored? Science advisors tell all (or at least some…) John Scalzi, science advisor for Stargate: Universe and Kevin Grazier, science advisor for Battlestar Galactica and Eureka, discuss. Notes: I’ve done this panel with Kevin before, and it was fun then; I expect it will be fun now. Notes: I suspect I am on this panel because I have won a Seiun Award, for my novel The Last Colony. Beyond that fact, I intend to be quiet and let people who actually know something about the subject speak to it. Occasionally I will nod, sagely. Notes: I suspect I will read something new and never before heard by anyone. So, you know, be there. Notes: If you are a SFWA member, please plan to attend. We need 30 active or lifetime SFWA members for a quorum. We have the room for two hours but the last two business meetings took an hour, so we’re pretty good at getting you up to speed and taking member questions and comments in an efficient fashion. We’ve got lots to cover so I hope you can make it. Writers and business professionals discuss some of the odd nooks and crannies of the writing biz, including intellectual property, translation and taxation issues. Notes: Oh, boy! I get to wear my cranky business dude hat! Enjoying this year’s Worldcon? Learn all about next year’s Worldcon, which will be in Chicago, from Dave McCarty, the chair. Notes: YOU WILL BE IN CHICAGO IN 2012. At which I am Toastmaster. And which will be awesome. That is all. Stargate Universe distanced itself in many ways from previous versions of the franchise. Why? 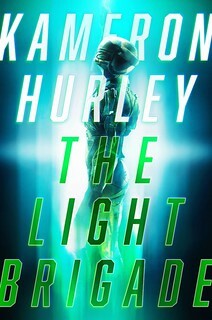 Was this influenced by its creators’ exposure to SF and SF fandom, and the resulting desire to do something more meaningful? Was it that it was the first post-Battlestar Galactica Stargate series, and that shows tone impacted SGU? 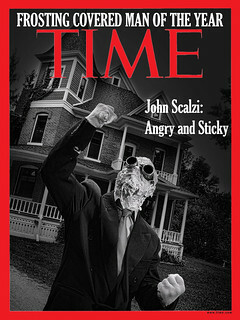 Did this contribute to its cancellation? Notes: I will not be on this panel, not because I have any objections to the subject of the panel but because there are a number of things about the subject I’m not at liberty to discuss because of contractual issues, etc. So a) I’ll be dead weight on the panel; b) I’ll frustrate people who come to the panel hoping I’ll be able to offer insider knowledge that I will not be able to. I’ve pinged the programming people to let them know; I probably should have done it earlier but lost track of this due to a writing deadline. Anyway, my fault. Sorry, folks. Notes: I was asked by Chicon7 head Dave McCarty to be part of the handing-over ceremony, so, hey, I’ll be here to say goodbye to Reno and hello to Chicago! Where I will be when not at programming: Well, I’ll be at the Hugos, of course, and I imagine I will also spend a fair amount of time in the SFWA suite, hanging out with SFWA members there. There will also be a SFWA table in the dealers area which I will also very likely be spending some time at. And otherwise, you know, I’ll be around, hanging out at parties and visiting the bar and whatnot. I will not be difficult to locate, basically.